After pondering about it, I’ve decided to not buy the OnePlus 3 this year and here are my Top 5 reasons. First, OnePlus 3 does NOT have 1440P screen like all flagship phones these days. All my flagship phones like Galaxy S7 Edge, HTC 10, LG G5, and Nexus 6P all have 2560×1440 resolution, which allows me to enjoy higher resolution video playback for YouTube, Netflix, Hulu, etc…etc… If you’ve never used a 1440P smartphone you probably won’t care but as someone who uses large smartphones between 5.5 to 6-inches on a daily basis, 1080P is simply not acceptable. That is one of the main reasons why my 4K Sony Xperia Z5 Premium is collecting dust as it can only play back videos stored in the phone in 4K and everything else/all apps are in 1080P. For smaller 5.2-inch devices, 1080P is more than sufficient but for 5.5-inches and bigger, 1440P is the gold standard these days. And if you want to enjoy OnePlus 3’s new Virtual Reality, the 1080P screen will make your VR look very pixelated. Trying to use 1080P VR is going back a few years back in time. If you like to buy outdated technology go ahead but 1080P is simply not acceptable if you want a “flagship killer”. Second, OnePlus 3 has hardware mismatch. It comes with features you don’t need such as 6GB of RAM. On a 1080P screen with latest Qualcomm Snapdragon 820 processor, 6GB is a waste of resources and will not make things run faster. OnePlus should have instead put in a higher resolution screen or at least have 1440P screen along with 6GB of memory. There’s also 64gigs of internal storage with UFS2.0 instead of EMMC which is great but that’s another tech copied over from Samsung Galaxy phones which have had it for a few years now. To top it off, OnePlus 3 has NO microSD card slot, you will be stuck with 64GB while every other flagship has microSD card slot (except Nexus 6P). Third, there’s nothing “special” about OnePlus 3 or anything that screams “flagship killer” or even flagship. With a 1080P screen and a decent F2.0 back camera, it doesn’t offer anything special like other flagships. Galaxy S7 Edge comes with a killer 1440P AMOLED screen with a battery that lasts forever along with IP68 waterproofing and awesome camera. Nexus 6P offers an awesome pure Google experience with ability to install Android N Preview on top of excellent still camera and GSM/CDMA radio support for all AT&T, T-Mobile, Sprint, and Verizon. HTC 10 also now has 1440P screen along with excellent speakers and updated camera with OIS on both back/front cameras not to mention laser auto-focus. LG G5 comes with the world’s first modular-type smartphone and two cameras on the back with one super wide-angle. There’s something special about each of those flagships but the OnePlus 3 doesn’t, it just offers more memory you don’t need and UFS2.0 tech copied from Samsung phones. Fourth, at price of $399, OnePlus 3 may seem like a “great deal”. But think again and it’s just a budget Android smartphone with budget features. While OnePlus One have wowed the world with its flagship features, clearly OnePlus Three isn’t nowhere near other flagships, it’s just a cheap Android smartphone. Fifth, OnePlus doesn’t exactly have physical locations in the U.S. for customer support while all other flagship phones can be bought and services at BestBuy or the local cellphone centers. If you break your OnePlus 3, that’s pretty much the end of it. Spare parts are hard to buy since it’s already a budget phone so in terms of customer support/repair, it may cost you more to fix your OnePlus 3 while you could easily fix flagship phones at your local cellphone repair shop. These are my reasons why I am not buying OnePlus 3 and I am just being plain honest here. You are probably better off spending a bit more for a real flagship phone instead of buying hype and becoming a cash cow for OnePlus. 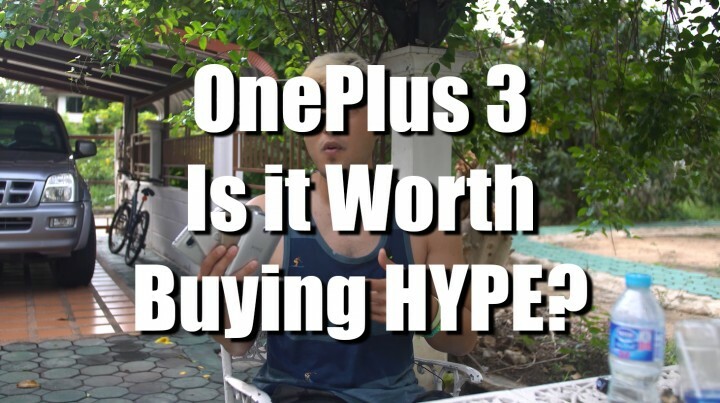 I usually agree with you 100% but this time the Oneplus is a must buy. Pretty good. I had the S6 ram was a real issue and with my note it seems to be fine. However ram is always good to have. Screen 1080p agree with you maybe they can make 1440p but drains the battery faster. I like the oneplus but love my s pen and use it on the daily bases. As per your review you clearly stated that missing 4k display is issue but I don’t think like that because still 4k videos were huge in size and not must for mobiles. We will hardly notice the difference. 1080P with ameloid display is good for better battery consumption. But 6 GB ram really worth. Watch XDA reviews. Also 64 GB is more than enough for normal to high users. But some people mentality will differ. Oneplus sticks with 64 GB internal based on their previous customers feedback. Also it can record and playback 4k resolution videos. Also this is best you can buy for half of the rate of other smartphones like Sony, Samsung,lg…. If you have money to spend nearly more than 50 thousand go for Samsung galaxy s7 or above 60k go for iphone or else if you have less than 30k go for oneplus 3. All are value for money. Previous story Best U.S. Carriers for International Travel Data and Voice!